There are many types of cycles inside living organisms and across the Earth. One of these is called the carbon cycle. It's a large cycle that involves the movement of carbon (C) through living organisms and the non-living environment. Plants are a good starting point when looking at the carbon cycle on Earth. Plants have a process called photosynthesis that enables them to take carbon dioxide (CO2) out of the atmosphere and combine it with water (H2O). Using the energy of the Sun, plants make sugars (C6H12O6) and oxygen (O2) molecules. It's a process called carbon fixation. The carbon dioxide gas is fixed into more stable and usable organic molecules. All of the non-photosynthetic creatures on the planet use the oxygen and sugars created by plants. Even plants use the oxygen to survive when they break down their own sugars for energy. Another part of the carbon cycle happens when organisms (plant and animal) break sugars down into energy, water, and carbon dioxide. Animals are the non-photosynthetic creatures of the planet. They are not able to create their own food. Instead, they eat plants or other animals. The process of metabolism breaks down the sugars, proteins, and starches they eat. The results are energy for the organism, water, and carbon dioxide molecules. 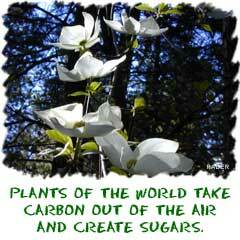 The carbon dioxide then returns to the atmosphere where the plants can use it again. So, your carbon dioxide is now back in the atmosphere. Cars and all internal combustion engines also create carbon dioxide when they burn gasoline. All of that CO2 gas goes into the atmosphere. While some of it is taken up by plants on the land and microorganisms in the oceans, it seems to be building up over the past few decades. Is it just because of humans, or is it natural? While there are natural changes in carbon dioxide levels, there is no doubt that all of our machines are adding to the buildup. We are also destroying many photosynthetic organisms as we harvest trees for wood or pollute the oceans of the Earth. As far as you are concerned, don't worry about your breathing. You can huff and puff all you want and it won't change the amount of CO2 in the atmosphere. If humans are putting extra CO2 into the air, it's from our machines and unmanaged environmental actions. There are also smaller cycles that happen in individual cells. The Krebs cycle is a label used to describe the citric acid cycle that occurs in the mitochondria. This smaller cycle takes a molecule called pyruvate (CH3-CO-COO-) and pulls energy out of it. Carbon dioxide molecules are released during the process. We told you about plants that fix carbon dioxide in the overall carbon cycle. Those carbon compounds are changed one piece at a time in the Calvin cycle in the chloroplasts of plants. You will discover smaller cycles in the synthesis, or creation, of amino acids. Humans can make many of their own amino acids, which will be used to build proteins. Sometimes we don't have a cycle to make a specific amino acid. To get that essential amino acid into our body, we have to find a plant or animal and eat it. That's just the way life works.